Carrots have been grown for over 2,000 years and are an important root vegetable worldwide, according to a 2012 article published in "Chronica Horticulturae." In Ancient Greece, carrots were used for medicinal purposes before they were used for food. These sweet and tasty vegetables are filled with fiber, vitamins, minerals and phytochemicals, which give them a number of potential health benefits. Most Americans don't consume enough fiber. Adding carrots to your diet can help you meet the daily value for fiber of 25 grams, as each cup of raw carrots provides you with 3.4 grams, or 14 percent of the DV. Getting plenty of fiber in your diet can help lower your risk for high cholesterol, type 2 diabetes, heart disease and digestive issues like constipation and diverticulosis. Since it slows digestion and makes foods more filling, fiber may also help you lose weight or maintain a healthy weight. Each cup of raw sliced carrots provides you with 408 percent of the DV for vitamin A, 12 percent of the DV for vitamin C and 20 percent of the DV for vitamin K. You need vitamin A for healthy vision, immune function and proper cell division. Vitamin C is an antioxidant that helps prevent cell damage from compounds called free radicals. It helps form the collagen you need for healing wounds . Blood clotting and forming strong bones both require that you eat enough vitamin K.
Eating a cup of raw carrots will provide you with 11 percent of the DV for potassium. Potassium helps counteract the effects of sodium, potentially lowering your blood pressure and your risk for heart disease, if you consume enough of it. You also need potassium for nerve and muscle function. Although research is still in the preliminary stages, it appears that carrots contain compounds that can help kill off cancer cells, according to a study published in "Anti-Cancer Agents in Medicinal Chemistry" in July 2012. The polyacetylenes in carrots seem to be the most responsible for this effect. More research is needed, however, before carrots can be recommended as a cancer preventative or for treatment. If you want to get the most benefits from your carrots, choose organic carrots. 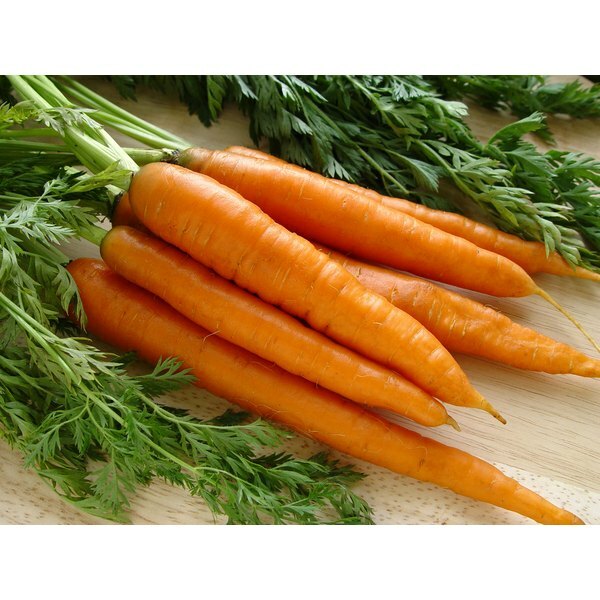 A study published in the Polish journal, "Roczniki Pan´stwowego Zakładu Higieny" in 2009, found that organic carrots contained more beneficial carotenoids, polyphenols and vitamin C than conventional carrots. Another study, published in "Journal of the Science of Food and Agriculture" in November 2012, found that organic carrots stimulated immune function in mice more than conventional carrots. What is the Vitamin K Content of Carrots?